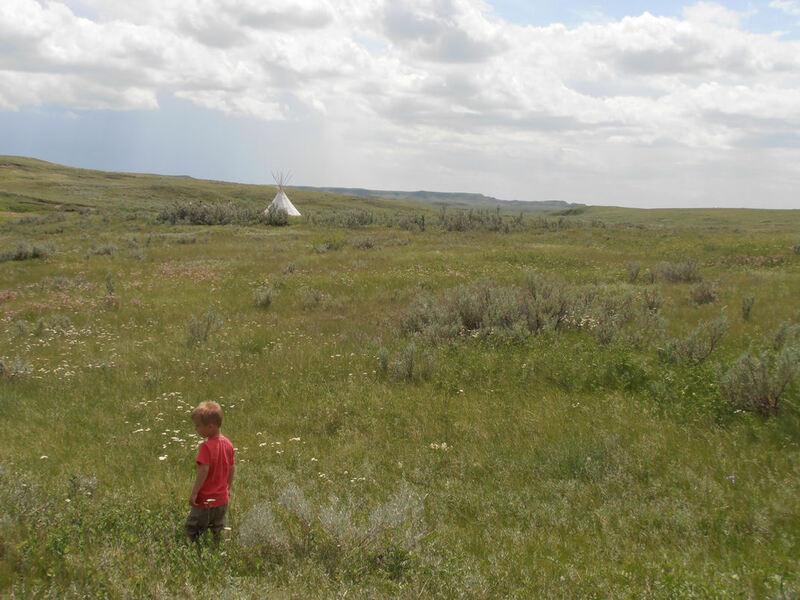 In May 2013, my family (husband Matt and kids, Emilia and Matthew) took a trip out to the Grasslands National Park near Val Marie and were immediately captivated by the beauty of what it had to offer. So much so, we immediately set out to book a three day/two night summer adventure taking in both the West Block (Frenchman Valley Campground) and the East Block (Rock Creek Campground). And boy did we have fun! In the summer months, the Grasslands National Park runs a number of programs and activities in both the West and East Block (http://www.pc.gc.ca/pn-np/sk/grasslands/activ/activ1.aspx) so it is worth spending a bit of time finding a program which will suit your own personal requirements prior to booking your trip. As we started our trip from Swift Current, it was easier for us to begin our adventure in the West Block near Val Marie. Our first stop was the Grasslands Visitor Centre where we confirmed all program times, picked up the Xplorer program booklets for the kids and paid for our camp fees. We had booked our first night in one of the three tipis (teepees) available in the West Block and our kids (aged 3 and 8) were very excited. Our second stop was the neighbouring schoolhouse for the obligatory cappuccino and playground visit before we headed out to the National Park. A deer mule peeks out from the grass. The wildlife was in abundance, and while we did not see any black-footed ferrets or bison, we were treated to the sights and sounds of mule deer, prairie dogs and burrowing owls. After setting up the camp beds in the tipi (these were optional along with the tipi rental) we proceeded to make a fire to roast the marshmallows and cook the hot dogs. Our camp meal gave us enough energy to explore the park enabling the kids to fill out their Xplorer booklets in anticipation of their reward on the final day. One great aspect of the West Block is that it offers a wide variety of trails to suit all ages. As my kids are not avid hikers, they preferred the short stroll from the campground to the horse tire swings in the neighbouring field. 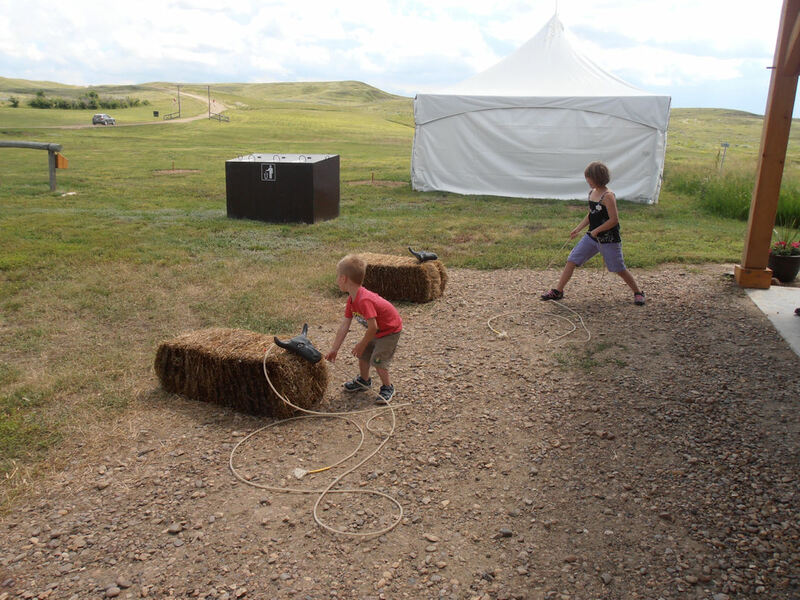 We also enjoyed the Larson Ranch and the kids got a kick out of trying to lasso the “bison” bales. 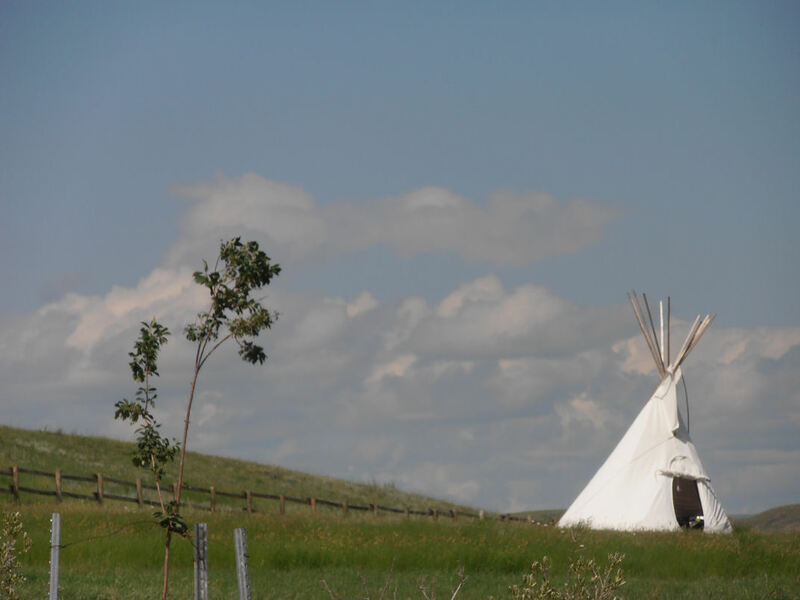 Following a short rest in our tipi, we headed to the Coulee Centre for the park program at 7pm. 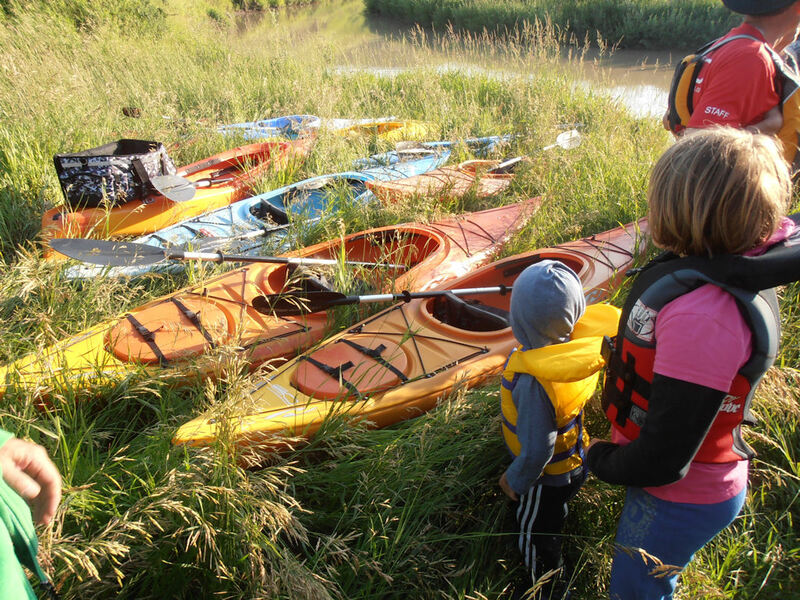 We had signed ourselves up for the “My Family’s Greatest Adventure” program which included kayaking, craft activities and a campfire. The kayaking was enough to whet our appetite (we were in the water for about 30 minutes) and the kids enjoyed being taken up the river separately by the guide. After our water adventure, we drove back to the camp and the kids proceeded to decorate some photo frames and other odds and ends (the park staff took their photo to go with it) while the adults enjoyed a cup of coffee. We were also offered a complimentary supper of s’mores and hot dogs to go with it. The “My Family’s Greatest Adventure” Program was a big hit. Staff and campers happily interacted with one another around the campfire providing a more lively camping experience than you would normally find and once darkness enveloped us, we retired to our tent for the evening. The East Block is actually over 2 hours away from the West Block and we were keen to explore some new territory. Heading through Mankota and Glentworth, we drove to the Rock Creek Campground into what is known as the Badlands. 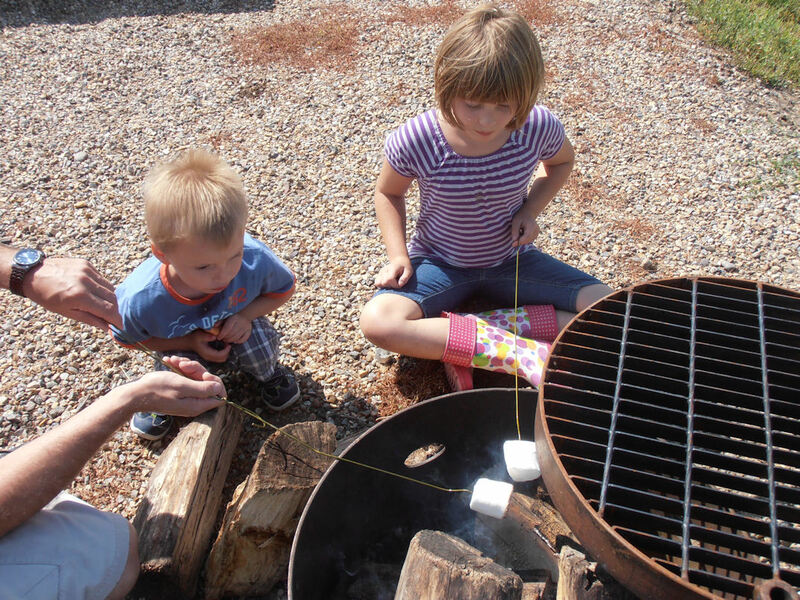 While we did not spend much time at the Rock Creek Campground due to our program schedule, it offers a similar experience to that of the West Block. There are a number of trails available to educate and inspire guests, and campers can choose to pitch their own tent or stay in the tipi site available (there is only one tipi offered at Rock Creek Campground). It is necessary to book the tipis in advance for either the East or the West block to guarantee availability. Crossing the prairie in covered wagons. We had booked ourselves into the “Tribes and Trails in the Uplands” program that afternoon and this proved to be a fascinating experience for kids and adults alike. 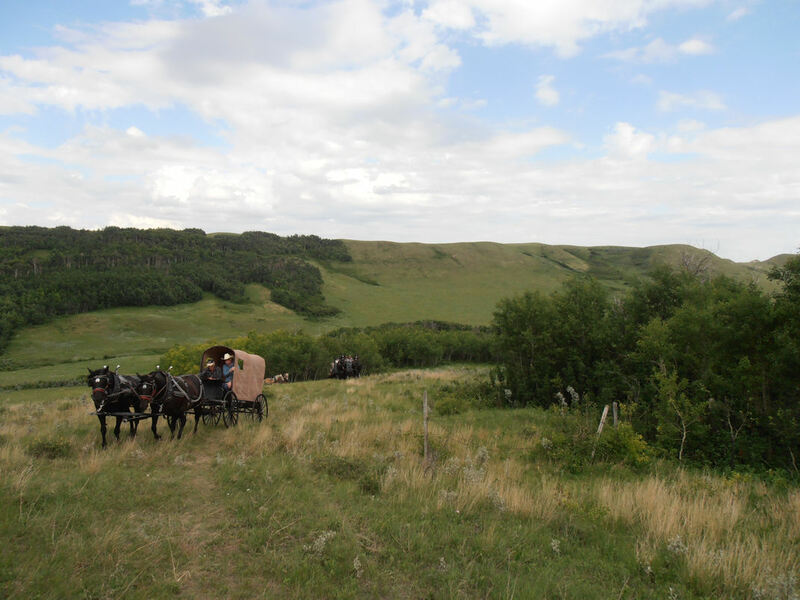 This actually involved us venturing off the beaten path to a local ranch situated in the Uplands and enjoying stunning scenery and history by horse drawn wagons through both private property and National Park property. We were informed that this was the third time they had done this and each time they refined and developed the experience to be bigger and better than ever. We can certainly confirm that this was the highlight of our entire trip. 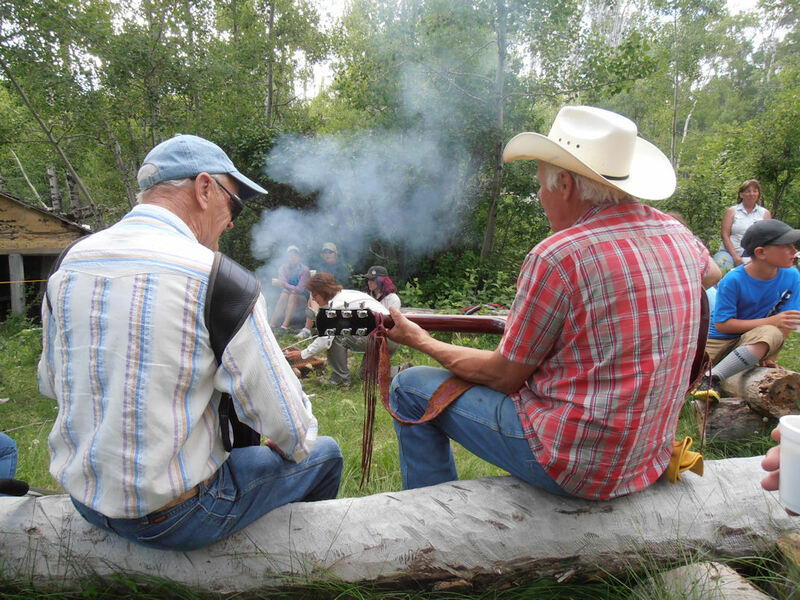 We were treated to a traditional campfire with cowboy coffee, cowboy tunes, cowboy tales and the whole experience took us back to a time which is rarely experienced nowadays. 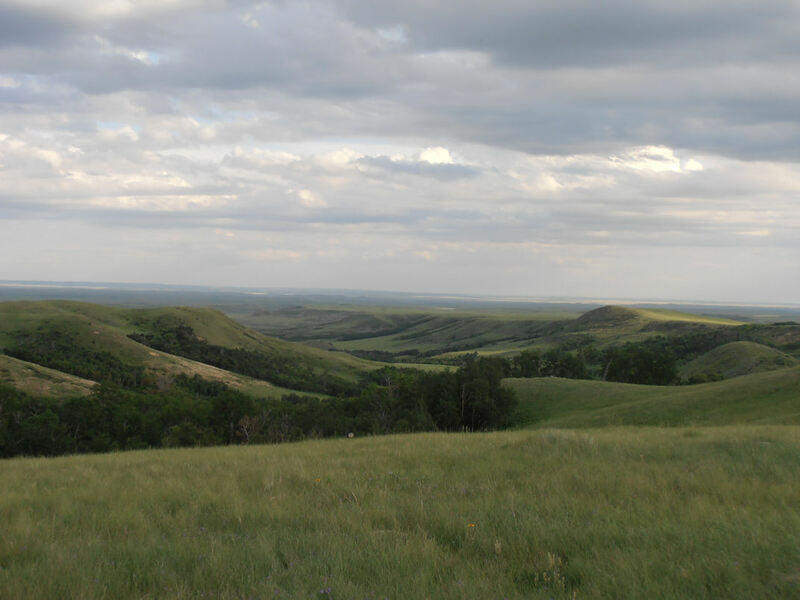 It was definitely a sight to behold as the wagon train ventured over the hills and beyond, and for those who complain about the flatness of the Saskatchewan scenery, you will quickly change your thinking once you have visited this part of the province. Saskatchewan is definitely NOT flat. As the Rock Creek Campground was situated over an hour from the ranch itself, we had, prior to our departure, arranged to camp out on the ranch and were offered a beautiful secluded spot on the property to pitch our tent. We were treated to true Saskatchewan hospitality both that evening and the next morning and it was definitely hard for us to say our goodbyes. After a delicious pancake breakfast the next morning, we drove back to Val Marie where we said our final farewells to the friendly park staff and the kids handed their Xplorer programs over in exchange for dog tags and certificates. After a cappuccino respite (and some delicious chocolate brownies to go with it) and some playground time for the kids, we headed back home. Sadly our adventure had come to an end! What struck us from the beginning of our initial visit was the hospitality of the park staff when planning and executing our trip. They answered all of our questions right down to the last detail and were quick to come to our assistance as and when necessary. From all of us to all of you at both the West and East Blocks (with a special mention to Brenda Peterson for allowing us to camp on her family ranch) – thanks so much!!! You have created special memories that we will never forget. Gotta Go: This place was obviously planned by a woman! As soon as you enter the West Block gates, you are immediately greeted by a nice clean porta-pottie (all that bumping down the #4 highway takes it’s toll, and you will definitely need it!). There are also clean porta-potties at each of the campgrounds. 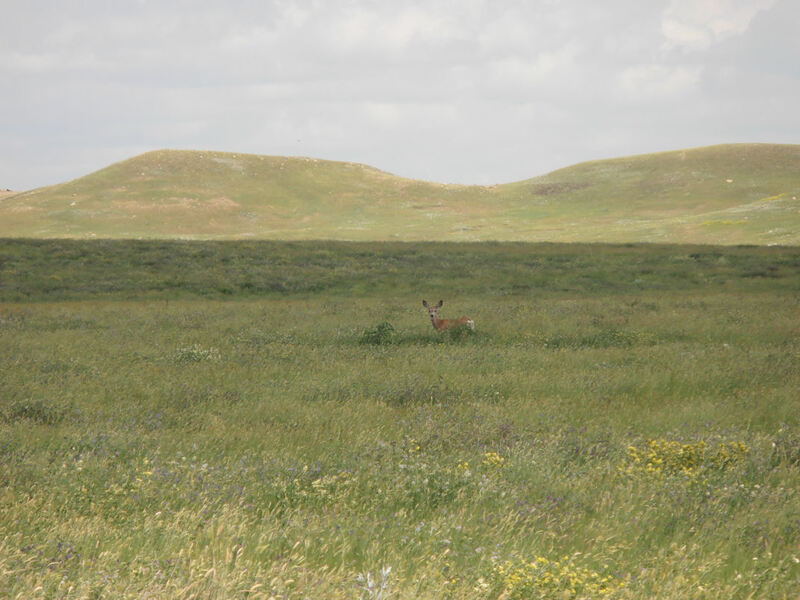 Visitor Information for GrasslandsNational Park can be found here. There are rattlesnakes in the park (though a freak natural accident two summers ago did kill off 90% of the population) – so look where you walk.